DEMO ALPHA 0.2 (November 2nd, 2015) - DOWNLOAD HERE. Step into the role of the hive-mind responsible for deep space search and rescue in a time where humanity's been forced from Earth. Spread across five bodies and four species, your job was to be the last, best hope for those lost in space to be found. But when tragedy strikes, and a danger as old as the universe starts to creep into our solar system, it's up to you to decide the fate of more than just humanity. Control every character's decisions, reactions, and interactions within the story. Direct it, control it, and make it your own. Make the tough calls, shape dramatic conflicts, and live or die by the consequences of what you choose. With over thirty story paths and thousands of possibilities, no play-through of Laika Dosha will ever be the same. Laika Dosha brings the story to life with hundreds of digitally-painted illustrations by artist Oouna, and hours of music and sound composed by Jon Fini. With a full-length soundtrack, musical score, and a complete gallery collection, Laika Dosha offers the reader a rich and engaging experience. Rochefort Writes is the professional writing company owned and operated by author Patrick Rochefort. He is the writer and director of this project, and it is his vision which will take you into the void. He finds tremendous inspiration drawn from modern “bleeding edge” science-fiction authors, like Peter Watts, Paolo Bacigalupi, and Cory Doctorow, fearlessly bleak writers willing to make characters suffer for the sake of a good story. Who made those wonderful pictures? The artistic vision of Laika Dosha is brought to life by Oouna. Livestreaming and prints of Laika Dosha artwork is available to Patreon supporters! By supporting Laika Dosha you are able to take part in its development. You can see it grow and change with your input and become greater because of you. Patreon supporters will be polled regularly on design and narrative input. You can become eligible for exciting rewards, and each milestone we reach offers you a better game. We are very excited and we hope you take this incredible journey into the stars with us. Message us via Patreon as well! 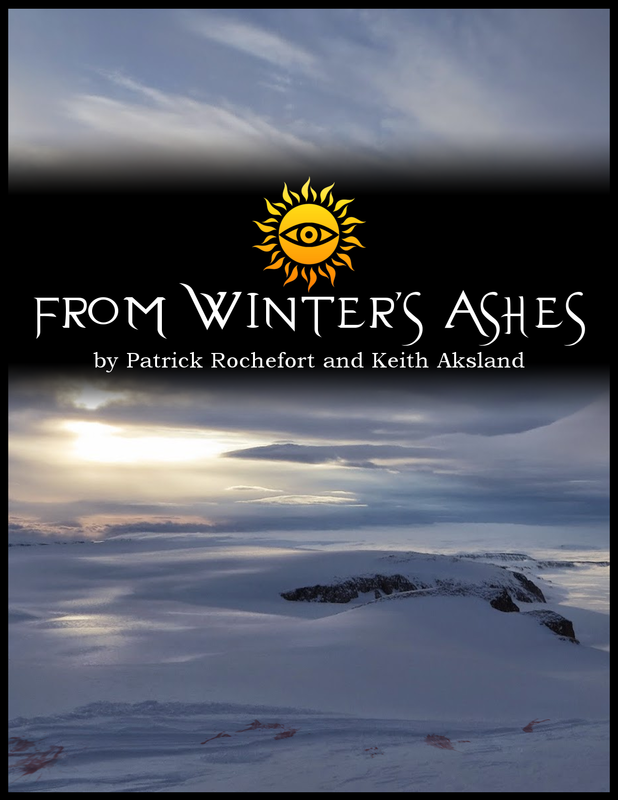 From Winter's Ashes is a Fantasy web serial, with chapters published weekly. When Church Detective Heather Blackthorne's husband and son were butchered in front of her eyes, she thought it was the worst moment of her life. She was wrong. Their bones stolen, an act of terrible retribution by the lone survivor of a necromantic cult she believed she had smashed. Her life shattered, her career in ruins, and her last shot at redemption squandered, Heather finds herself sent to the high north by the Church she serves. And what peace is to be found in a quiet arctic outpost is all too quickly broken, as her past comes hunting for far more than her, this time. Digital Soundtrack included with release. Early access viewing of illustration and other work. Your vote decides one of the endings of the game! An in-game gallery of illustrations, important scenes, and character art available for you to relive your favorites parts of your journey.